When recording many people get latency which is that annoying echo sound you hear in the headphones and it is basically a delay you get with the software. It makes it very hard to record a vocal. In Pro Tools there is a knob that will toggle between your mix and your recording that is supposed to help with latency but it does not help at all. Some software have a low latency setting which again is pretty useless. The key to getting rid of latency is to mute the track you are recording on while recording. It will not effect the recording at all and you will find no latency at all! 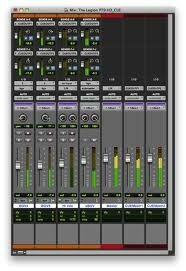 This works really well on Pro Tools M-Box.